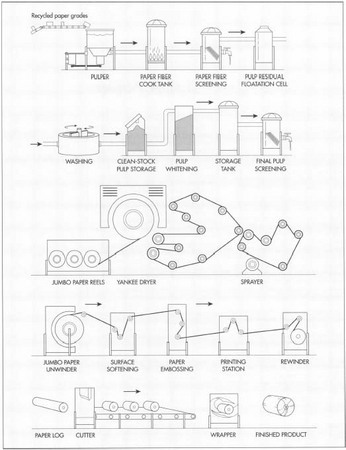 A diagram of toilet paper manufacturing process. now perforated, and may be scented, embossed, or colored. Recently, toilet paper manufacturers increased the number of sheets on a roll, allowing consumers to replace the roll less frequently. Trees arive at the mill and are debarked, a process that removes the tree's outer layer while leaving as much wood on the tree as possible. The debarked logs are chipped into a uniform size approximately 1 in x 1/4 in. These small pieces make it easier to pulp the wood. The batch of wood chips—about 50 tons—is then mixed with 10,000 gallons of cooking chemicals; the resultant slurry is sent to a 60-ft (18.3-m)-tall pressure cooker called a digester. During the cooking, which can last up to three hours, much of the moisture in the wood is evaporated (wood chips contain about 50% moisture). The mixture is reduced to about 25 tons of cellulose fibers, lignin (which binds the wood fibers together) and other substances. Out of this, about 15 tons of usable fiber, called pulp, result from each cooked batch. The pulp goes through a multistage washer system that removes most of the lignin and the cooking chemicals. This fluid, called black liquor, is separated from the pulp, which goes on to the next stage of production. The washed pulp is sent to the bleach plant where a multistage chemical process removes color from the fiber. Residual lignin, the adhesive that binds fibers together, will yellow paper over time and must be bleached to make paper white. The pulp is mixed with water again to produce paper stock, a mixture that is 99.5% water and 0.5% fiber. The paper stock is sprayed between moving mesh screens, which allow much of the water to drain. This produces an 18-ft (5.5-m) wide sheet of matted fiber at a rate of up to 6,500 ft (1981 m) per minute. The mat is then transferred to a huge heated cylinder called a Yankee Dryer that presses and dries the paper to a final moisture content of about 5%. Next, the paper is creped, a process that makes it very soft and gives it a slightly wrinkled look. During creping, the paper is scraped off the Yankee Dryer with a metal blade. This makes the sheets somewhat flexible but lowers their strength and thickness so that they virtually disintegrate when wet. The paper, which is produced at speeds over a mile a minute, is then wound on jumbo reels that can weigh as much as five tons. The paper is then loaded onto converting machines that unwind, slit, and rewind it onto long thin cardboard tubing, making a paper log. The paper logs are then cut into rolls and wrapped packages. Ierley, Merritt. The Comforts of Home. New York: Clarkson Potter, 1999. Muir, Frank. An Irreverant and Almost Complete Social History of the Bathroom. New York: Stein and Day Publishers, 1983. Charmin Bathroom Tissue. http://www.charmin.com (January 2001). Georgia Pacific. Student Resources. http://www.gp.com/resourcecenter/process.html (January 2001). Marcal Paper Products. http://www.marcalpaper.com (January 2001). what are the chemicals used ih soft tisue manufacturing. mostly what is the right chemical used for softning of soft tissue paper. This article was very informative. Easy enough for me to read the main points to my 5 year old (it was her initial question that pushed my inquiry as to where Did toilet paper come from) as well as indepth enough to fully explain the process. Thank you very much!! Where doing this science fair project and we need to know everything about paper towals.